Hello and Happy Hump Day! You've made it this far so just keep pushing through! 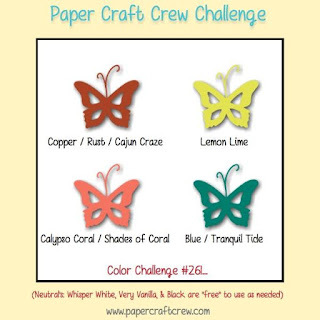 I'm over with the Paper Craft Crew with a card for a color challenge that was indeed a bit of a challenge for me. I was NOT feeling these colors at all! Once I decided to use my September 2017 My Monthly Hero Kit and realized I could do some color layering to make them work, it turned out ok.. I hope! 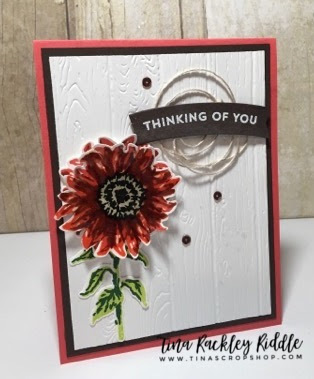 lol I'm sure you can think of something more fabulous than I did so please head over to Paper Craft Crew for some inspiration and to link up a card of your own! So for this one I started with a 11" x 4 1/4" sheet of SU Calypso Coral Cardstock. I added a 4" x 5 1/4" piece of SU Early Espresso Cardstock over the Coral. Next I used the SU Pinewood Planks Dynamic Embossing Folder to emboss a piece of 3 3/4" x 5" piece of 80# Neenah White Cardstock and added it to the Early Espresso Layer. Then on another piece of 80# Neenah White Cardstock I stamped my stem and leaves SU Lemon Lime Twist for the bottom layer and Tranquil Tide for the detailed layer. My Flower was stamped in SU Calypso Coral for the base layer. The first detail layer was stamped in SU Cajun Craze and the second detail layer was stamped twice in Cajun Craze to darken that layer. The center of the flower was stamped in SU Crumb Cake first and then Gina K Designs Black Onyx Ink. (Note.. somehow I have lost my Versafine Tuxedo Black Ink.. how does one loose an entire ink pad?????) I stamped two of the flowers exactly alike using my Misti so that I could layer them. I used the coordinating dies to cut out the stem with leaves and the two flower images. The top layer was handcut between some of the petals to allow more dimension. I used a bone folder to bend the layers out. I added the top flower with foam squares and added some FSJ Journey Glaze to the flower for some shine and drama! Concord and 9th's Pineapple Perfection Bundle was used for the sentiment and banner. I cut out the banner die first in SU Early Espresso and Stamped the "Thinking of You" in Versamark Ink and then heat embossed it in White. Some Natural Thread hoops were added with a small foam square in the middle and then the banner was added over the thread with small foam squares on each end. It was finished off with Pretty Pink Posh 4mm Espresso Sequins. I hope you like what I came up with! I ended up loving it!